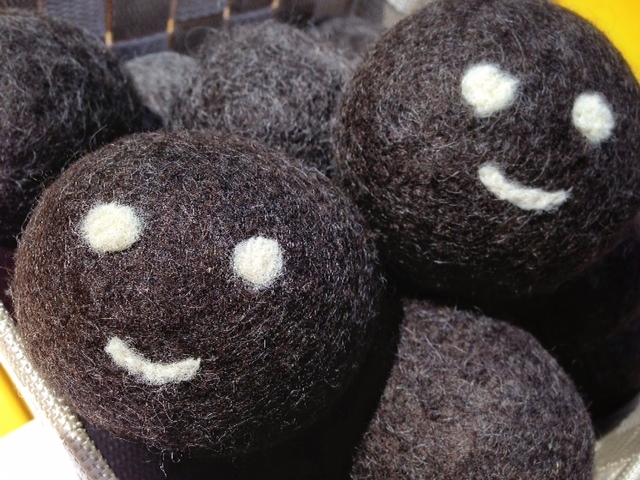 We have started making wool Dryer Balls, they are very popular with the Farmers Market crowd. 3 balls used in the dryer reduces drying time by 1/3 to 1/2 depending on your dryer. They work by absorbing moisture and increasing air circulation and rotation. They also reduce wrinkles! They work especially well with natural fibres like cotton and are a safe for sensitive skin, so great for cloth diapers. The David Suzuki Foundation has given these energy efficient little guys their stamp of approval! You can even add a few drops of essential oil to the surface to add your own natural fresh scent to your load. We sell them 3 for $18. (with or without happy faces). Posted on September 8, 2013 by rousaystation	• Bookmark the permalink.